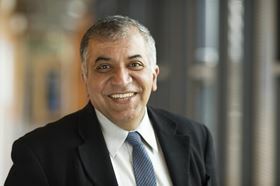 I am currently the Scientific Director of the Centre for Research in Medical Devices (CÚRAM), but I’ve had a career in industry as well as academia. My PhD – from University of Alabama at Birmingham – focused on wound-healing and fibrin-based biomaterials and since then, I’ve worked across the medical devices sector. I’ve secured regulatory clearance and approvals for a hydrophilic wound dressing and a family of collagen vascular sealants for FDA submissions. Through the establishment of the national centre (CÚRAM), we have established a critical mass of biomaterials expertise in Ireland. This underpins the development of innovative and transformative device-based solutions to treat global chronic diseases including neural, musculoskeletal and cardiovascular clinical targets amongst many others. I was inducted as an International Fellow in Biomaterials Science and Engineering by the International Union of Societies for Biomaterials Science and Engineering, and I am also a Fellow of the Tissue Engineering and Regenerative Medicine International Society – the first Ireland-based academic to be bestowed with this honour. I have published more than 200 papers in peer-reviewed journals, filed numerous patents and licensed four technologies to medical device companies. CÚRAM is a national Centre for Research in Medical Devices funded through Science Foundation Ireland and industry partners. Its goal is to radically improve quality of life for patients with chronic illness by enhancing and developing medical devices. We have developed targeted controlled drug-release systems, drug-device combination products and multicomponent biomaterial-based selective delivery systems to deliver molecules to specific organs, cells and/or sub-cellular compartments. These functionalised biomaterials work synergistically with the body to improve or replace functionality. Other developments of note include our hollow extracellular-matrix-based spherical constructs, which provide sustained localised responsive delivery at the target site. These ‘smart’ functionalised biomaterial systems reduce adverse side-effect profiles, as well as drug degradation and loss, and overcome the limitations of existing drug-delivery systems. These developed chemistries are being processed for clinical application and integration into medical devices. Our biomaterials expertise includes target identification and lead optimisation, formulation design, physicochemical characterisation, toxicity testing, bioavailability and efficacy assessment in preclinical models. The biomaterial scaffolds developed at CÚRAM have been validated for their use as templates for constructive remodelling and as templates for the induction of de novo functional, site-appropriate, tissue formation. Thanks to support from industry, foreign investment and the Industrial Development Agency (IDA) Ireland, we have developed a functionalised patented collagen scaffold encapsulating hollow spheres, which facilitates neuro-regeneration through inhibition of the innate inflammatory response – thus representing the first effective therapy for Spinal cord injury. We have also developed a novel patented cholecyst (gallbladder)-derived extracellular matrix (CEM) scaffold, which has been licensed to an Irish medical device company. What facilities and equipment does your lab have? Facilities available across CÚRAM’s member institutes include specialised equipment for biomaterials synthesis, formulation, fabrication and characterisation as well as manufacturing and processing facilities – this enables the manufacture of biomaterials from the nanoscale to the macroscale level. Fully equipped molecular biology, functional genomics and imaging and microscopy suites and a mass spectrometry core facility enable extensive physico-chemical and biological characterisation of implant systems. We also have equipment for physicochemical drug analysis, device design and testing and a national Biophotonics Imaging Platform, including preclinical imaging. 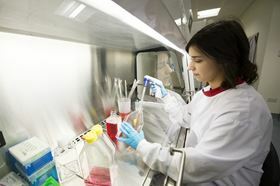 In addition, our facilities incorporate a state-of-art Centre for Cell Manufacturing, as well as a preclinical research facility and clinical research and trials infrastructure. How does academia compare to industry, in terms of the development of medical devices? Academia differs from industry in the sense that we are engaged in more ‘blue sky’ research, testing concepts and ideas before developing any prototypes. There is a lot more ‘risk-taking’ in research terms in academia. Not every research project will result in a new product, but these projects still serve to expand our knowledge base in the research area. However, the best research projects for medical devices are those carried out in collaboration with industry partners, chiefly because these collaborations allow us to explore more mechanistic questions around device design and development. What developments in biomaterials should we be most excited about? The research process at CÚRAM begins with the identification of an unmet need. Our work covers a very wide spectrum. Once we have identified an unmet clinical need we work on developing a solution to it. We have teams of scientists, engineers and clinicians who work together on this. For example, if we are developing an electrode for deep brain stimulation in the treatment of Parkinson’s disease, we will start off by looking at the materials required and how they can be synthesised. We then move on to designing the implant. We cover the whole ecosystem. Fundamentally we get inspiration from nature, whether it is unravelling the body’s intricate defence mechanisms or investigating nature’s inherent architectural systems. 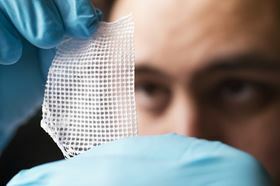 Some of the current projects include developing responsive biomaterials that are triggered by the underlying pathology. These responsive biomaterials can be functionalised with inbuilt gradients of physical, chemotropic and neuroprotective cues to target injury mechanisms at the molecular and cellular levels. These macromolecular complexes can form functional interfaces between implanted devices and biological systems to endow the former with bio-responsiveness and/or biological function. A steady supply of excellent research students and postdocs, as well as the support of funding agencies, is essential. It is critical to make sure that everyone on the team understands that they are valued and that every opinion matters. It is also important to develop a nurturing environment in the laboratory that allows for individual growth at multiple levels. We have a multidisciplinary environment and diverse skill sets at CÚRAM, and my group currently hosts researchers from 25 countries. In this environment, individual successes are team successes. It is also important for every one to know that they are part of the system—the success of the lab depends on them and their own success is critical for their future career. Looking ahead, the goal is to develop next-generation biomaterials combining multiple functions such as drug release, recognition, responsiveness and tuned biodegradability. Biochemical functionalisation of these responsive biomaterials with carbohydrates, nucleic acids, antibodies, peptidomimetics and glycan conjugates will influence fundamental physiological processes with high potency and selectivity and represent the fastest growing classes of new drugs capable of selective delivery to specific organs, cells and/or subcellular compartments in response to specific clinically relevant endogenous stimuli. These pH, oxygen, MMP and neutrophil responsive systems will be designed and developed to recapitulate developmental processes and provide dynamic stimulation for a broad range of chronic degenerative disease clinical targets. CÚRAM is a national centre bringing together experts from Ireland’s leading universities and research institutes. Our academic partners led by the National University of Ireland Galway include University College Dublin, University College Cork, Trinity College Dublin, University of Limerick, The Royal College of Surgeons of Ireland and Molecular Medicine Ireland. Industry collaboration is vitally important for the translation of research into the next generation of medical devices and implants. We work very closely with industry, as we need to have good commercialisation partners. We also work with international teams to address issues and which have an impact across the EU and globally. Lang, Y., del Monte, F., Collins, L., Rodriguez, B.J., Thompson, K., Dockery, P., Finn, D.P. and Pandit, A. ‘Functionalization of the Living Diatom Thalassiosira Weissflogii with Thiol Moieties.’ . 2013: 4: 3683. ( doi: 10.1038/ncomms3683). Browne, S., Monaghan, M.G., Brauchle, E., Berrio, D.C., Chantepie, S., Papy-Garcia, D., Schenke-Layland, K. and Pandit, A. ‘Modulation of Inflammation and Angiogenesis and Changes in ECM GAG-activity Via Dual Delivery of Nucleic Acids.’ . 2015: 69: 133-147. Dash, B.C., Thomas, D., Monaghan, M., Carroll, O., Chen, X., Woodhouse, K., O’Brien, T. and Pandit, A. ‘An Injectable Elastin-based Gene Delivery Platform for Dose-dependent Modulation of Angiogenesis and Inflammation for Critical Limb Ischemia.’ . 2015: 65:126-139. Samal, J., Hoban, D.B., Naughton, C., Concannon, R., Dowd, E. and Pandit, A. 'Fibrin-based Microsphere Reservoirs for Delivery of Neurotrophic Factors to the Brain.’ . 2015: 10(5): 765-783. Thomas, D., Fontana, G., Chen, X., Sanz-Nougés, C., Zeugolis, D., Dockery, P., O’Brien, T. and Pandit, A. ‘A Shape-controlled Tuneable Microgel Platform to Modulate Angiogenic Paracrine Responses in Stem Cells.’ . 2014: 35(31): 8757-66. Laurie Winkless spoke to Prof. Jonathan Coleman to learn more about his work. Improving materials processing will help industry use less and become more sustainable.